I have a bit of a problem. If there was a support group for people addicted to buying books, I would have to start attending meetings. For now, I’ll just confess it to you. Notice I said “buying books.” I wish I had a better problem — an addiction to actually reading the books. It’s not that I don’t like to read or haven’t read many of the books on my shelves, but I do find it easy to convince myself that I need a certain book and then finding it sitting on my shelf for several months before I actually crack it open. There are several different kinds of books on my shelves. There are some I’ll probably never read cover-to-cover but that sit on my shelf for reference. There are others that I devour and which will eventually get handed on to a friend to enjoy. There are others I acquired free that I may never read. There are books that I enjoyed but I probably won’t read again. Then there is one that is rarely on my shelf. It may be on the table next to my favorite chair, it may be in a bag, or it may be in my car. It’s a book I’ll never finish. 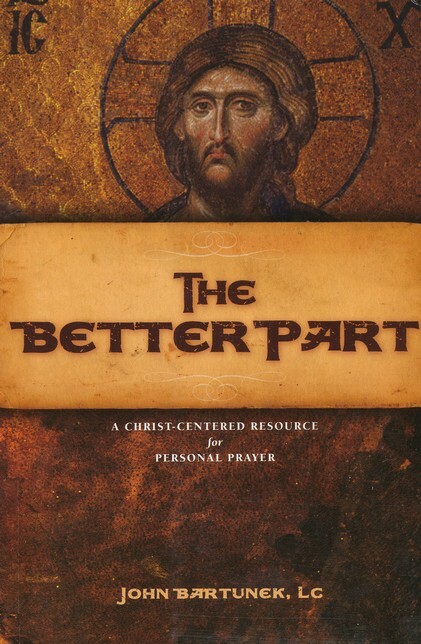 The Better Part: A Christ-Centered Resource for Personal Prayer has already proven to be a companion of mine for many years; I anticipate that will not change. In this thick book, Father John Bartunek has included the text of all four Gospels, broken down into sections often corresponding to the way the Church has broken down the Gospels for the liturgy. After each section, Father Bartunek guides you through the passage to help you pray with Christ. I have always been drawn to lectio divina, the ancient way of praying with the Scriptures so that the Word of God becomes your prayer, but I have not always done it well or done it faithfully. The Better Part has changed that dramatically. The first section of the book takes you through the practice of lectio divina, and the rest of the book helps you to live it out. Benefitting from the fruits of Father’s own prayer, the book takes your prayer life and douses it with the Word. I took her advice and took the book to the Adoration chapel. As I devoured the section, it was as if Father – or the Holy Spirit- had written the passage just for me. It was exactly what I needed to hear. It was nothing new, but it refreshed insight that I needed desperately at that moment. One sentence in particular struck me, and I went along with my day renewed. Shortly after I left the chapel, I realized that I had already read that same section a few days earlier. The same section, read twice in the space of a few days… but yet the second time I had received completely new insight. Perhaps we could chalk it up to lazy reading the first time, but I don’t think we can dismiss it that easily. I was bringing different baggage to the passage the second time I read it, and it was prepared to handle that baggage. Six years later, I could read that same passage and probably wouldn’t remember what line spoke to me then – I need something else now. Because the Word of God is at the root of this book, it is a book that can accompany everyone throughout life. It’s for the single person struggling to make his or her way alone in this world and the mother of five who barely has time to pray. It’s written for the beginner who doesn’t know what lectio divina is and the person who could teach lectio divina. It is not a book that you read from cover to cover, mark off your list, and put on your shelf to collect dust. It is a resource, a tool to help you pray better during the time you set aside each day. If you’re looking for an easy street prayer life, don’t look here – prayer lives aren’t ChiaPets… they’re not created overnight and they’re certainly not easy. But if you’re looking for help beginning to pray or taking your prayer to the next level, you should probably start with the Word of God. And I’d highly recommend starting that with The Better Part.